Nanabozhu is on his way to Detroit Lakes, Minnesota, where the people are unique and peculiar. “Can you pull up next to that guy driving that semi?” He rolls down the back passenger side window to the Chrysler Town and Country. “I don’t think it’s going to accomplish anything.” Says the blond in the front seat. “Well, I have to try,” he replies. By now they are alongside the guy driving the semi at 75 miles an hour. Nanabozhu sticks his head out the window (which doesn’t quite open up all the way so he’s kinda squished through it.) The trucker looks down at them and sees an older Anishinabe fellow squinting with effort as Nanabozhu tries to make a rolling motion with the one hand he can get out of it. The truck driver rolls down his window with a curious look on his face. With the wind whipping by, he thinks he hears Nanabozhu yell something like “Your barn door’s open!” (Which is a euphemism for “the zipper on your pants is undone”.) Nanabozhu can see him mouth “What? !” with an incredulous look on his face. “Your back door is open!” Nanabozhu yells again. The trucker smiles and waves with that easygoing look of someone who has heard you say something but is too polite to tell you that they didn’t quite understand what you said. Their Town and Country pulls ahead, leaving the truck behind with Ben their driver glancing back in the SUV’s rear view mirror to watch the trucker checking his side view mirrors looking like someone who, with a little thought, has finally figured out what you were trying to say, and the trucker finally begins to pull off the road. Now that I am back, I have been thinking about the different feeling of living on the reservation versus living away from it. 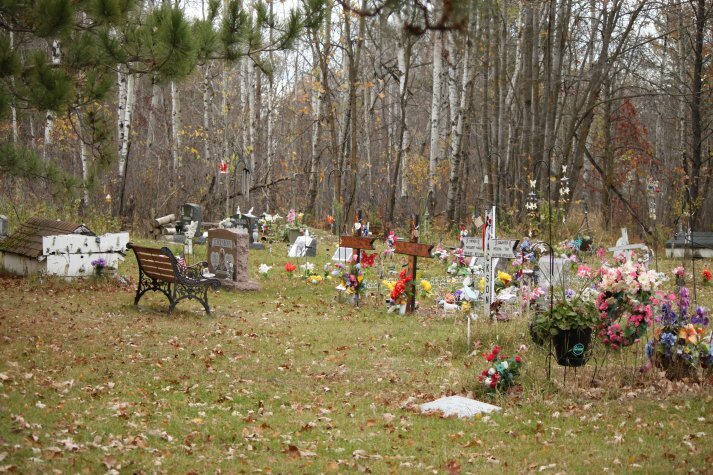 The Anishinabeg are blessed to live in Red Lake. There is a different feeling living there. Ours is big for one thing, so there is a lot to see. I found myself rediscovering places I had known before, but also discovering new things and new places. As time passes I discovered many things stayed the same and many things had changed. The scenery is all so varied. There are different kinds of lakes: Red Lake, which is BIG, and small lakes, lakes of different sizes, lakes which have different kinds of fish in them, rivers creeks, swamps. sloughs, marshes, Forests of different trees: Birch, Jack Pine, Norway Pine, Cedar, Poplar, Maple, Various Oaks and Tamarack, and all the different kinds of plants. I also found myself enjoying spiritual experiences. I don’t mean supernatural experiences, I mean just meeting another/other beings. Sometimes those were people: family, friends, people from high school, and people I hadn’t met before. Sometimes they were the crows, deer, eagles, squirrels in mom’s back yard, mom’s or the many neighbor’s dogs, the huge bears at the dump, fish in the water, the partridges I heard out in the woods, ducks, geese, loons, a field mouse. I am reminded that we take so many things for granted. I remember moving here to Missouri and seeing a Nuthatch hopping down (facing downward) a tree trunk looking for bugs. The first times it was such a novel experience. Now I take it more for granted. The point is however, that there are so many strange and beautiful things in nature, and I found myself wanting to travel about the reservation as an exercise in experiencing those things. One difference, I suspect was that I felt this was land held in common with other Anishinabeg that I could experience as I wanted, subject to my personal controls of common sense, moderation, and consideration, and not to the outside rules imposed on me by an impersonal authority. New Super Power Discovered in Northern Minnesota! I discovered I had a new superpower as I stepped off the plane in Bemidji. I was invisible! It’s true. Grown-up people I didn’t know did not see me until I said something to them or did something to attract their attention. They looked right through me! This was not true for children. They could see me all the time. So it must have something to do with complicated minds. This power became stronger as I traveled through Red Lake. Sometimes people could not see me, even if I waved at them! The interesting thing about this super power is that while my friends could see me easily, the more people did not know me, the more it seems like I had a force field around me that actually repelled their gaze. It just slid around me. I’m not sure I want to say too much about it as the NSA and the CIA might want to make use of it. I know it would come in handy in places that are not Minnesota. Perhaps it’s like the instinct in monkeys. You don’t want to look them in the eye because one of you might be afraid the other is hostile. I just wonder if this is an invisibility gene that comes from someplace. The other interesting thing I found was that I was not alone in having this super power. It is also true that all the other Minnesotans and especially the Indians have it as well. But I think it is like a fish being underwater. The water is all around us but since we are in it all the time we don’t notice it until someone points it out to us. Up to this point I have never re-blogged a post, (considering such a thing to be cheating). In this case, I thought Lori’s blog was so good that I’d make an exception. Enjoy. As we rapidly approach the end of 2012, I believe now is a good time to focus on something big. What I’m talking about is an issue so deep and dark that it has plagued my community for at least twenty years. It’s the root of many reasons why so many people are emotionally disconnected and refuse to attend meetings, volunteer, or have generally anything productive to do with the tribe whatsoever. Yes, folks, it’s high time I address the elephant in the room because frankly, he’s been toying with my community for far too long.